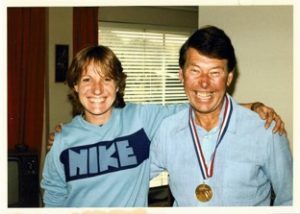 ‘THANK YOU TO RON STONEHOUSE’ by Christina Boxer, former AFD athlete, Triple Olympian, 1500m Commonwealth Champion and first British Woman to break 2 minutes for 800m (1.59.05) in 1979. I was a very timid, nervous and unconfident 12-year-old when I first met Ron at AFD, someone who would go on to be one of the most important and influential people in my life. The week before I had finished 6th in the Hampshire Schools Athletics Championships against girls up to two years older than me. My school had suggested I join Camberley AC, a club closer to where I lived, but the then President of AFD, the late Jim Horsborough, had luckily spotted this tiny, scrawny schoolgirl down in 6th spot from high up in the stands at the Alexandra Stadium in Portsmouth. He was ‘talent spotting’ for AFD and asked to speak with my parents, suggesting to them that I went along to meet their running coach, Ron Stonehouse, at Sunday morning training. How one event/decision can change a person’s life! Ron’s warm and un-pushy approach was just what I needed to give me the confidence to join AFD and to start my wonderful athletics journey to Olympics, British Records and Commonwealth Gold. By age 14 years I was English Schools and National Champion, excelling at 800m and cross country off just three training sessions a week, with Ron passionate about not over training young athletes. At 15 years old I had started to focus a bit more on 1500m, enjoying much success and running national age-best and Junior European qualifying times. But then, as is so common with teen-age girls going through puberty I got an injury and started to fill out and put on a bit of weight. Ron NEVER mentioned the additional weight I was carrying or tried to push me while injured. Instead he encouraged my parents to talk with specialists and for me to take a break until the injury was resolved. He still invited me along to the club and to the club social events to keep me involved and did not push me aside when injured. I did drift away a little though, focusing on important school exams. My parents were also wonderful and never pushed, but just encouraged me when I was a couple of years older to still have a go back in athletics as I had enjoyed going along to AFD so much. For four years my times never improved from when I was a 15-year-old, and many thought I was just another young flash in the pan, but Ron never stopped believing in my talent. He gradually built up my training and by age 19, I was beginning to return to form and at age 20 won my first GB International vest. At 21, I gained selection for my first of four Commonwealth Games, running a disappointing final in the 1500m and at age 22 became the first British woman to break 2 minutes, recording 1.59.05 in the European Cup in Turin behind quite a few very muscly, huge Eastern European runners. From then on, my running really took off. Ron had always believed in ‘Long Term Athlete Development’ (LTAD) long before it gained lots of academic publicity and articles in magazines. He also spent extra time marking out reps on the grass Polo fields at Aldershot to avoid the stresses of training on synthetic tracks too often. Many of my rivals had trained much more than me when I was in my early teens but then struggled to progress when older or dropped out completely from the sport due to injury or burn-out. Ron also believed in quality training for middle distance runners, focusing less on lots of mileage, and this really suited me. He was a master at giving sessions that really created lots of lactic acid but ones that you were able to recover from, thereby avoiding burn-out. I also benefitted from the fact that Ron trained most of the male runners in the club too and I often had the benefit of being pushed by some of them, not least of all Roland Yeomans who would often sacrifice his own training to help pace me and some of the other girls. I went on to win Commonwealth Gold, set a then British record (4.00.57) and gained a European Cup silver medal and Olympic 6th place at 1500m between 1982 and 1985 under Ron’s tutelage. My Commonwealth Games victory was down under in Brisbane, Australia and was my first-time racing in the southern hemisphere and dealing with all the travel, heat and jet-lag. Long haul flights and a time change of 10 hours can be very debilitating, especially if you were not use to it. The England team selectors had wanted me to double up in the 800 and 1500m but the 800m was first and by then I was specialising more in the longer distance. I knew I would never forgive myself if I ended up with two silvers when the goal I had set with Ron was to win my first major international gold medal. My 800m speed was not wasted though as I was able to use it to kick to victory in the last 300 meters of a fairly slow and tactical race with the Queen watching in the stands; and my gold medal was presented to me by Sir Roger Bannister…. proud moments. That is another reason why Ron was the perfect coach for me as he was great at setting ‘step goals’, progressing gradually throughout my career. Knowing that Ron sadly passed away on Tuesday 10th April 2018, the same day as the Women’s 1500m final at the current Gold Coast Commonwealth Games, has reminded me even more of those wonderful athletics days back in the 1980’s. The photo that my dad took of me celebrating with Ron at his home in Farnham when I first got back to the UK, as previously posted on the AFD facebook, is such a treasured memory. He would never have wanted to pose for the media; his beaming smile is priceless! 5 years on and I had married sub-4minute miler, Sean Cahill, and settled in the North-East. Sadly, the distance made it too difficult to continue being coached by Ron. However, my best career race in 1988 under a new coach, just missing an Olympic medal when finishing 4th in the Seoul 1500m in 4.00.64, had so much to do with my formative years training with AFD colleagues under Ron’s wonderful guidance. I was sadly beaten by three Eastern Bloc runners, two Russians and a Rumanian benefitting from ‘State training programmes’ at a time when they could not be tested out of season due to the political Iron Curtain between the East and West. The Russian, Tetyana Samolenko, who finished less than three tenths of a second in front of me in third place was banned a few years later for taking performance enhancing drugs. For all we know, AFD’s Ron Stonehouse might have been known as a coach who helped produce an Olympic medallist if the testing had been as thorough worldwide as it is now! I myself went on to coach between 1998 and 2003, helping Jo Pavey to overcome a chronic injury to reach her first Olympics in the 5,000m at Sydney and then Charlotte Penfold (nee Moore) to set the Junior 800m record (1.59.75) and gain a European Junior silver medal. Much of this was due to what I had learnt from being coached by Ron and I am certain that other runners in Ron’s training groups, like Mick Woods, will have also gained much valuable experience. So, his legacy lives on with future generations and his contribution to AFD is immeasurable, reliably planning programmes and turning up for Club training sessions for so many, many years. I tried, like Ron to do volunteer performance coaching while also working fulltime to pay for the mortgage etc and found it too much to cope with and so my admiration for what Ron achieved for so many years is immense. With Ron coaching myself to become the first British woman to break 2 minutes for 800m and me coaching Charlotte to become the first British junior woman to break 2 minutes he will always be a ground breaker for British women’s middle-distance running. Being such a modest man, Ron Stonehouse would never take the credit for what he has helped achieve in athletics but those of us who knew him well with never forget what a great person, coach and club man he was. So, I am sure my fellow Olympians and Internationals including Bernie Ford, Roger Hackney and Ruth Smeeth, and so many other members of AFD, would like to join me in saying huge thank you to Ron for everything he has done for us.